Senior officials from the Colombian and Brazilian embassies like Colombian General Juan Pablo Amaya, as well as top DC representatives from Venezuelan coup leader Juan Guaido’s shadow government, also participated in the meeting. Since then, Venezuela has endured a series of provocations and the steady escalation of punishing economic sanctions. President Nicolas Maduro has accused the US of attacks on the Simon Bolivar hydroelectric plant at the Guri dam, which have led to country-wide blackouts openly celebrated by top Trump officials. Since then, however, Guaido has failed to mobilize the national protest wave the Trump administration had anticipated, and the Venezuelan military has demonstrated unwavering loyalty to Maduro. In Washington, the sense of urgency has risen with each passing day. The CSIS meeting on “Assessing the Use of Military Force in Venezuela” suggests that the Trump administration is exploring military options more seriously than before, possibly out of frustration with the fact that every other weapon in its arsenal has failed to bring down Maduro. On April 10, I obtained a check-in list containing the names of those invited to the meeting. It was apparently incorrectly dated as April 20, but had taken place earlier that day, at 3 PM. “We talked about military… uh… military options in Venezuela. That was earlier this week though,” Baumunk told me, when The Grayzone asked her about the meeting that was wrongly listed for April 20. When The Grayzone asked if the event took place on April 10, Baumunk appeared to grow nervous. “I’m sorry, why are you asking these questions? Can I help you?” she replied. After I asked again about the meeting, Baumunk cut off the conversation. “I’m sorry I don’t feel comfortable answering these questions,” she stated before hanging up. The Grayzone received additional confirmation of the meeting from Santiago Herdoiza, a research associate at Hills & Company, who was also listed as an attendee. “I’m sorry, that was a closed meeting. Good evening,” Herdoiza commented when asked for details on the event. Few of these figures are well known by the public, yet many have played an influential role in US plans to destabilize Venezuela. The complete check-in list can be viewed at the end of this article. Below are profiles of some of the more notable figures and organizations involved in the private meeting. (Names of attendees are in bold). Given his participation in the CSIS meeting on attacking Venezuela, his accusers might have had a point. 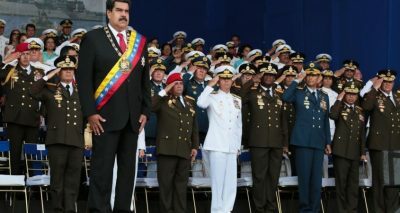 On February 20, Tidd’s successor, Admiral Craig Faller, threatened Venezuela’s military and urged it to turn on Maduro in support of the US-backed coup attempt. Mark Feierstein, a NSC official at the time who now works as a senior associate at CSIS and attended its April 10 meeting, was reportedly involved in the plot. However, the plan fell apart as soon as the US sanctioned Cabello under pressure from Sen. Marco Rubio. Fernando Cutz and Juan Cruz, former National Security Council officials at the Cohen Group: Cutz collaborated closely with Brownfield on the plan to generate rifts in Maduro’s inner circle. Born in Brazil, Cutz is a career USAID foreign service officer who worked on Cuban policy under Obama and entered the Trump NSC under its former director, Gen. H.R. McMaster. Cutz is credited by the Wall Street Journal with presenting Trump with his initial platter of options for destabilizing Venezuela, starting with “a financial strike at Venezuela’s oil exports.” Cutz’s colleague at the Cohen Group, Juan Cruz, was Trump’s former Latin America director. In March 2018, Cruz became the first US official to openly call for the Venezuelan military to disobey Maduro and implement a coup. Pedro Burelli, BV Advisors: A former JP Morgan executive and ex-director of Venezuela’s national oil company PDVSA, Burelli allegedly helped foot the $52,000 bill for a series of meetings in Mexico in 2010 where Guaido and his associates plotted to bring down then-President Hugo Chavez through street chaos. In an interview with The Grayzone, Burelli called the Mexico meetings “a legitimate activity,” though he refused to confirm his participation. Today, he makes no secret of his desire for Maduro’s removal by force, tweeting images of jailed Panamanian President Manuel Noriega and the murdered Libyan leader Muammar Ghadafi to suggest preferred outcomes for Venezuela’s president. Roger Noriega, American Enterprise Institute: A veteran of the Iran-Contra scandals and regime change operations from Haiti to Cuba, where he plotted to sabotage US efforts at rapproachment – “stability is the enemy and chaos is the friend,” he said – Noriega has been at the center of Washington’s efforts to impose its will on Venezuela. Last November, Noriega recommended that Trump appoint Ambassador Brownfield to lead contingency plans for a military invasion of the country. Carlos Vecchio and Francisco Marquez, Guaido’s shadow embassy in Washington: Installed as the symbolic ambassador of the Guaido coup regime in Washington DC, Vecchio currently oversees no consular facilities and has no diplomatic authority. He is wanted in Venezuela on arson charges and was photographed posing with a young man who brutally beheaded a woman named Liliana Hergueta. Marquez is associated with Vision Democratica, a DC-based lobbying outfit which employs another Venezuelan opposition member who attended the CSIS meeting on military force, Carlos Figueroa. Emiliana Duarte, Caracas Chronicles and advisor to Maria Corina Machado: Duarte’s name was crossed off the CSIS check-in list, indicating that she was invited to the private meeting on military options but did not attend. She is a staff writer for Caracas Chronicles, a leading English language publication echoing the political line of Venezuela’s opposition. Duarte has also contributed to the New York Times, most recently in February, when she argued that the US-backed coup attempt was, in fact, “Venezuela’s very normal revolution.” Nowhere in Duarte’s writing has she acknowledged that she is serving as an advisor to Maria Corina Machado, a close ally of Sen. Marco Rubio and one of the most extreme figures among Venezuela’s opposition. In 2014, a series of emails were leaked allegedly revealing Machado’s role in an alleged assassination plot. “I think it is time to gather efforts; make the necessary calls, and obtain financing to annihilate Maduro and the rest will fall apart,” Machado wrote in one email. Santiago Herdoiza, Hills & Company: While Herdoiza appears to occupy a low level position, he works at a high powered international strategy firm founded by former George W. Bush administration officials. The firm works on behalf of clients like Chevron, Boeing, and Bechtel to “eliminate barriers to market access and profitability.” In some cases, the firm says it has been able to persuade governments to lower tariffs and drop opposition to free trade deals. Through its participation in the private CSIS meeting, Hills & Company seems to have signaled that it is willing to also entertain the use of military force to open up markets for its clients. David Smolansky, OAS coordinator for Venezuelan migrants: Once a leader of Guaido’s US-backed Popular Will party, Smolansky took sanctuary in Washington and began working for regime change in 2017. Following the US recognition of Guaido as “interim president,” Smolansky was appointed by OAS President Luis Almagro as coordinator for Venezuelan migrants. While it is unknown what advice Smolansky offered at CSIS regarding a military assault on his country, there is a near-consensus in Washington that an attack would massively exacerbate the migration crisis. A war on Venezuela “would be prolonged, it would be ugly, there would be massive casualties,” Rebecca Chavez, a fellow at the Inter-American Dialogue, declared in testimony before the House Foreign Affairs Committee in March. (Chavez’s boss, Michael Shifter, was a participant in the CSIS meeting on use of force).